Well thank goodness that counted for nothing! The Dogs started the game behind the 8-ball, down a man in the first 10 seconds and down on the scoreboard shortly afterwards. The team showed some guts hanging in there down 3-0 early on the road, but there aren't many positives to take out of this one other than maybe it's nice to get it out of the way, and it's nice to get the new players the experience of playing away from home. 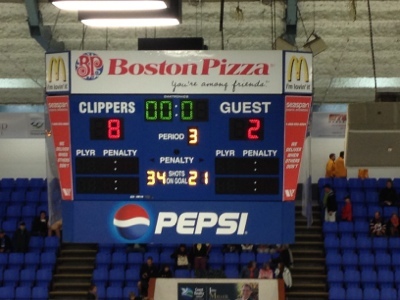 Final stats, unofficially...I had the Clippers at 3 for 3 on the power play while the Dogs went 0 for 5. Connor Lacouvee started the game for the Clippers before giving way to former Bulldog AP Nathan Alalouf. Bryce Dirocco went the distance for the Dogs. Next up - a visit from the Victoria Grizzlies on Wednesday night!